Available for Kindle (£38.48/$58.94) and in the iTunes Store (£42.99). Frederic Edwin Church (1826-1900) was one of the founding Masters of American landscape painting, and central to the Hudson River School. 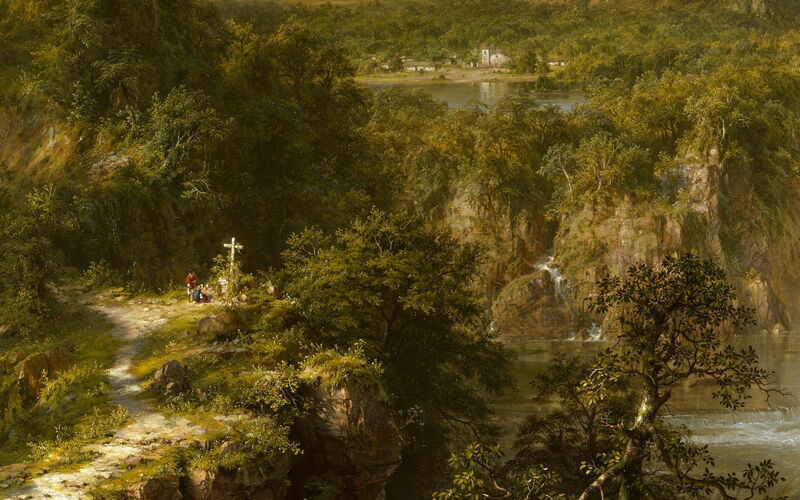 As the only pupil of Thomas Cole, who founded the School, Church has a pivotal place in the history of American painting. His career started at the time of the Barbizon School, and continued into the height of Impressionism in France, and its coming to North America. Unlike those, and subsequent US landscape painters, Church was a devout realist (although usually of composite scenes) who produced a series of huge canvases with meticulous, almost obsessive, detail. He was thus a rival to his contemporary, Albert Bierstadt (1830-1902) who worked largely within his unchallenged territory to the west of the Mississippi. Jennifer Raab’s account of Church and his paintings is not the first in recent years: John K Howat’s (2005) rather bulkier book appeared more than adequate, but has been out of print for some years, and Howat himself sadly died last June. Rather than attempting a replacement, she tackles Church’s work mainly from the aesthetics of detail, focussing on a series of five of his largest paintings which she considers key, and the way in which Church shaped Olana, his estate on the Hudson River. She specifically avoids the traditional interpretation of Church’s work in terms of the politics or ideology of national identity, a model which she considers too limiting. Frederic Edwin Church (1826-1900), Niagara (1857), oil on canvas, 101.6 x 229.9 cm, National Gallery of Art, Washington, DC. Wikimedia Commons. The first chapter is centred on Church’s Niagara (1857), starting with its detailed reading, supported by a magnificent double-spread of the whole painting and a series of details. I greatly appreciate expert readings (you may have discovered my own clumsy efforts in the Favourite Paintings articles here), and Raab’s are among the best that I have encountered – as might be expected of an Assistant Professor at Yale. She relates Niagara to its historical context, a time when secession of Southern states seemed imminent, the significance of the Niagara Falls, and how it became associated with union and unity of its details. In the second chapter, Raab takes us on Church’s travels to South America, first to The Andes of Ecuador (1855), then onto its main subject, The Heart of the Andes (1859). After guiding us carefully through its extraordinary details, again supported by a spread of the whole work and several carefully chosen details, Raab argues that the earlier painting reflects the cosmology of the explorer and naturalist Alexander von Humboldt, but the later ends up as a Darwinian painting in spite of Church’s attempts to make it the opposite. Frederic Edwin Church (1826-1900), The Heart of the Andes (detail) (1859), oil on canvas, 168 x 302.9 cm, The Metropolitan Museum of Art, New York, NY. Wikimedia Commons. 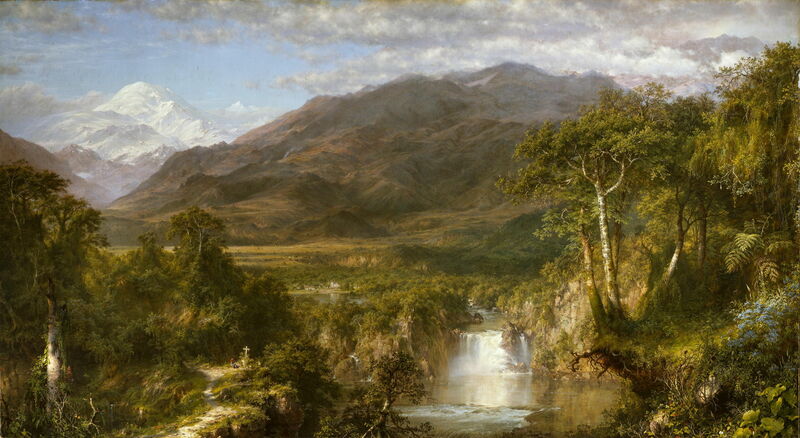 The third chapter develops considerations of the exuberant excess of detail in The Heart of the Andes (1859). She cites its commercial success – over 12,000 visitors paying 25 cents each over a period of a mere three weeks – and the recommendation given to viewers that they bring opera glasses in order to see the details through the crowd. Raab argues that this is a different way of seeing, as demanded by the painting, and details literary responses from the likes of Mark Twain and critics. Relating the painting’s solo exhibition in the lower Manhattan shopping district, and the emergence of the department store with its inviting windows, Raab’s interpretation spans the painting, the environment in which it was shown, American culture, and contemporary literature. 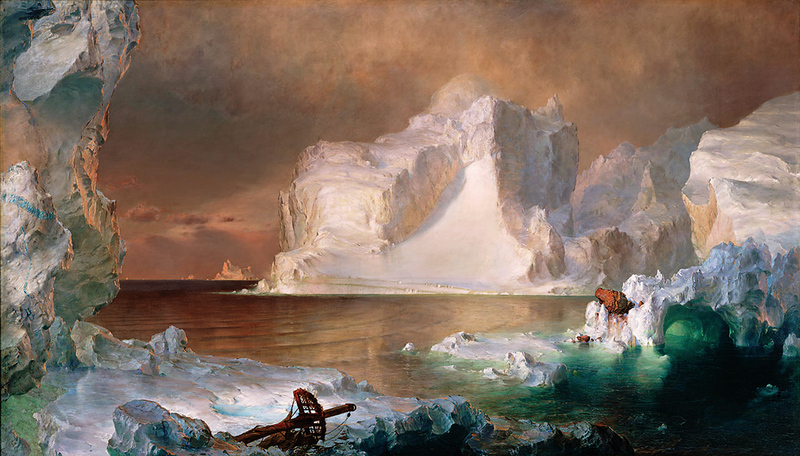 Frederic Edwin Church (1826-1900), The Icebergs (1861), oil on canvas, 163.8 x 285.8 cm, Dallas Museum of Art, Dallas, TX. Wikimedia Commons. From that great success, the fourth chapter considers the failure of Church’s The Icebergs (1861), which was unfortunate enough to be shown just twelve days after the start of the Civil War. In contrast to the human glimpses and intricate details of nature in The Heart of the Andes (1859), The Icebergs – known then as The North and lacking the broken mast in the foreground – disturbed by its apparent indifference, and resisted narrative of any kind. The fifth chapter examines one of Church’s paintings which followed his visit to Jamaica in 1865, Vale of St. Thomas, Jamaica (1867). 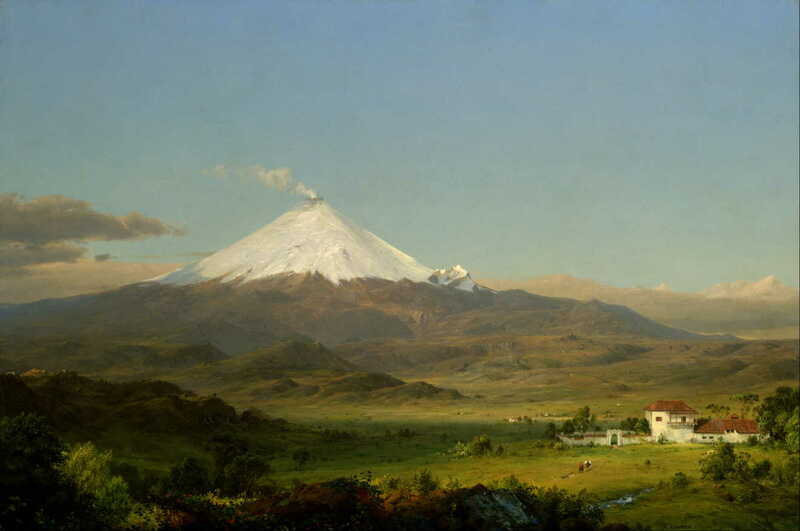 Sadly I have been unable to locate a copyright-free image of that painting, but it marked a return more to The Heart of the Andes (1859) with a picturesque prospect. Again Church was coincident with unrelated events: he and his wife left for Jamaica shortly after the death of both their children from diphtheria, the surrender of General Lee bringing the Civil War to an end, and the assassination of President Abraham Lincoln! Frederic Edwin Church (1826-1900), El Khasné, Petra (1874), oil on canvas, 153.7 x 127.6 cm, Olana State Historic Site, Hudson, NY. Courtesy of Olana State Historic Site, New York State Office of Parks, Recreation, and Historic Preservation, via Wikimedia Commons. 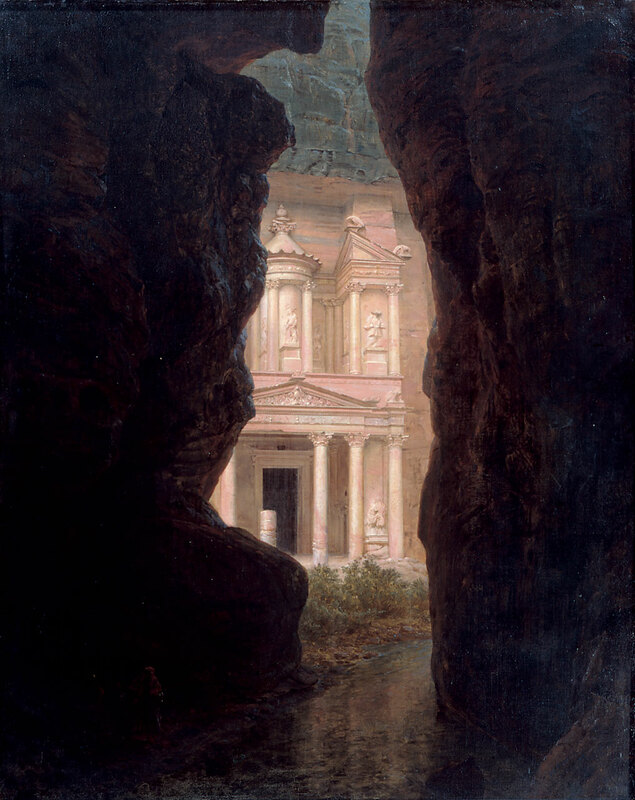 The sixth chapter starts with a briefer account of Church’s El Khasné, Petra (1874), which, together with his Jerusalem from the Mount of Olives (1870), was the product of his visit to the Middle East in 1868. El Khasné, Petra is an oddity, in showing a very unusual view which lacks sky, and frames its strongly vertical format. It is also quite short on detail, and what can be discerned from the murky depths of its framing appears mysterious and unresolved. 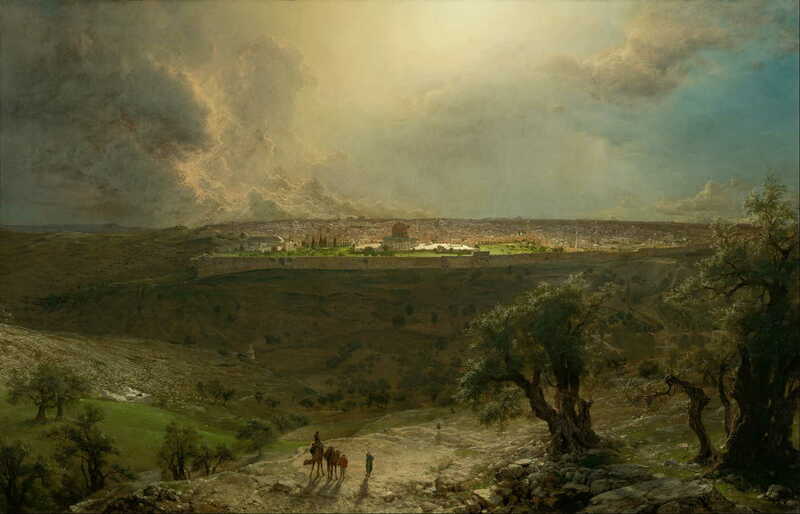 Frederic Edwin Church, Jerusalem from the Mount of Olives (1870), oil on canvas, 138 x 214.3 cm, Nelson-Atkins Museum of Art, Kansas City, MO. Wikimedia Commons. El Khasné, Petra was featured as the centrepiece to the Church family sitting room in his self-designed estate at Olana, the subject of the seventh chapter. Church started work on its design in 1870, engaging Calvert Vaux, a co-designer of New York’s Central Park, to assist. They assembled a pastiche of forms and styles into what Church termed a “Feudal Castle”, which the book illustrates with appropriate details. Raab concludes this tour-de-force with an epilogue in which she surveys Olana’s recent history and the involvement of artist Dan Flavin, provides some glimpses of Church’s oil sketches, and draws to a close. End-matter consists of extensive notes which incorporate references, covering nearly 30 pages, an excellent selected bibliography, and a single consolidated index. As usual I regret that this has not been separated into general and paintings, but it is quite comprehensive and works well despite that. This book is almost comprehensive in its far-ranging discussion of both principles and details, which inevitably include the concept of the sublime, and its expression in landscape painting. It is not to be rushed: Raab’s writing moves smoothly but quite briskly through a succession of major topics which merit thought and careful study of the many fine illustrations. Although Raab shows some of Church’s related and preparatory work, she does not direct her attention at his methods. According to Wilton (2013), he was an obsessive sketcher in oils, and amassed an embarrassingly huge library of sketches from which he developed the composite views in his large finished works. Those sketches were more painterly in style, but never attained the looseness of Constable’s. There might even have been scope for a chapter considering the detail of Church’s sketches. I was a little surprised to read (on page 45) that Church was disappointed by the Alps when he visited Europe in 1868. Yet Wilton (2013) shows fine oil sketches made in Bavaria and Austria which suggest that further research among his archives might yield a different story. Those are small questions which will no doubt be followed up in the future. Raab’s book achieves its purpose admirably, with a wealth of meticulous research into context, and a grand tour of contemporary thought, culture, and influences. For anyone interested in landscape painting, it is a richly rewarding read, and a thoroughly beautiful book. Given the recent rise of realist and hyper-realist painting, its aesthetic debates also have renewed relevance to modern art. I strongly recommend this book, and look forward to re-reading it in the future. For, like Church’s grand canvases, the delight is in the detail. Howat JK (2005) Frederic Church, Yale UP. ISBN 978 0 300 10988 7. Wilton A, with Bourguignon K & Riopelle C (2013) Frederic Church and the Landscape Oil Sketch, National Gallery, London. ISBN 978 1 857 09550 0. Posted in Painting and tagged America, Church, landscape, painting, realism. Bookmark the permalink.